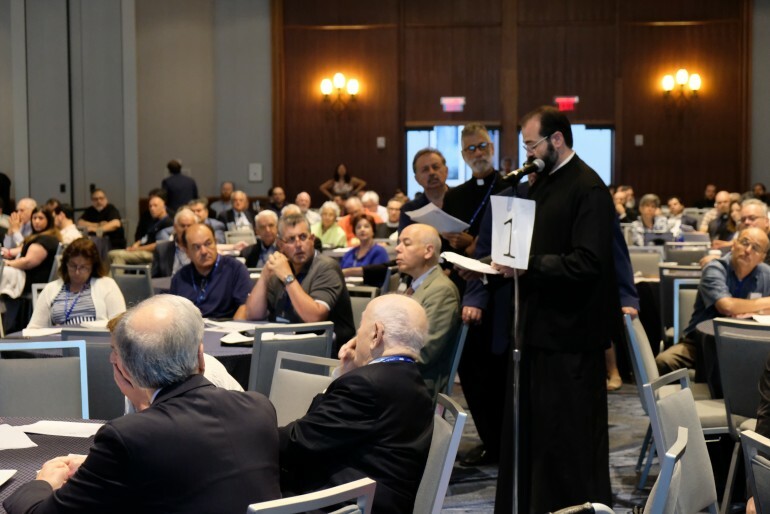 During the very sincere, frank and open discussions, both at Monday’s lengthy open forum and at Tuesday’s extended meeting of the Finance Committee, one issue that remained unanswered was about why the bill of the Crete Panorthodox Synod was picked by the Archdiocese of America. The amount the Archdiocese paid was $987,605 leaving a debt of $410, 190. When the question was raised at the Finance Committee meeting, on Tuesday, whether the Archdiocesan Council was briefed, the answers were unclear. «It’s probably clear to most of us that the activities of the Great Council had to be supported in a very significant way. We don’t have the information in detail on how all those expenditures were made. I hope that they were very conscious and efficient on what they did but I don’t have this information’, was the question asked by an Ohio priest. The Chairman of the Finance Committee, Lou Kirkos, in replying he said that the Archdiocesan Council wasn’t involved in that. 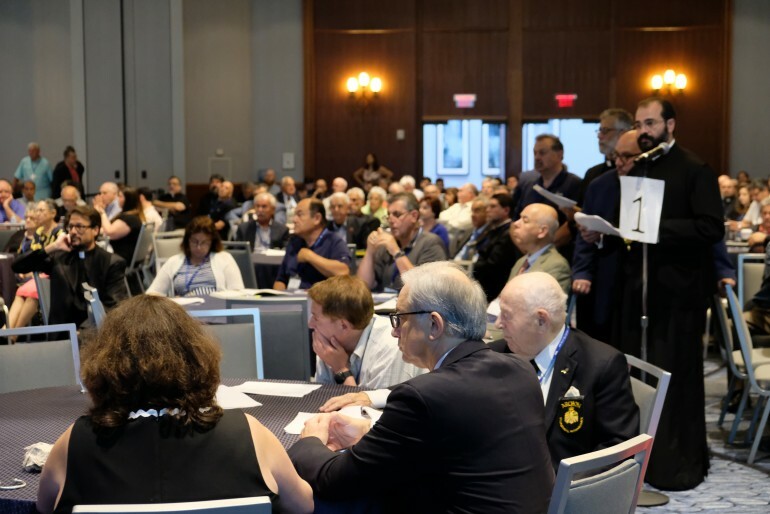 But, Dimitri Moschos, an Archdiocesan Council member and a past President of the Council, intervened in the discussion saying that “the Council was briefed. Replying to calls by delegates that our Church needs to apologize to its members for the financial crisis, Archdiocesan Council President George Tsandikos once more took the microphone at the meeting, saying he is sorry for the problems and that they didn’t detected them sooner. “We spend every time and effort to address them and I am sure that will never happen again”. Metropolitan Nathanael of Chicago suggested that no money from the Total Commitment of the parishes to be used for repaying the loan Archdiocese received from Alma Bank, but rather organize fundraising activities. “We should do as the Catholic Church which repaid 300 million dollars of legal expenses for the sexual harassment cases by not using parish funds. Lou Kirkos made a distinction that this is not the case in our Church. “We must finally leave it behind us and focus of the future. Criticism costs nothing but it takes a lot of effort to raise money.”. 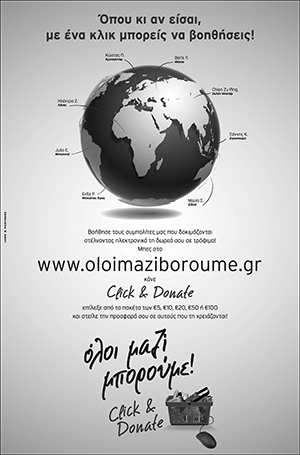 Tsivicos suggested set a fundraising goal and divide it among the metropolises. He praised the hard efforts of the auditing committee and finance committee members and asked the delegates to show them the gratitude they deserve. The issue of the 3% raise in the total commitment was discussed extensively. Calls like the one on the open forum “who serves whom” and the Archdiocesan ministries Vs the parish programs, were raised again. “We are struggling every month to pay our bills”, one parish president said. A priest from California suggested further cuts, while another to raise the support to the Hellenic College by $500,000. The issue of trust the parishes have to the Archdiocese was also mentioned. “We don’t have a money problem, but a trust problem”, one delegate said. In his presentation of Lou Kirkos showed how the first deficit (of approximately $400,000) occurred in 2013, but it was discovered in an audit 3 years later. “This is unacceptable”, he said. The same thing also happened in 2014, 2015 and 2016. “The statements and books were in disarray. We must insure that complete consistent statements to be available to the finance committee and all department”. The changes agreed call for an audit to take place within six months of the end of every year. Finally he praised the 88 parishes that have fulfilled in full their total commitment (19 from the Metropolis of Detroit). 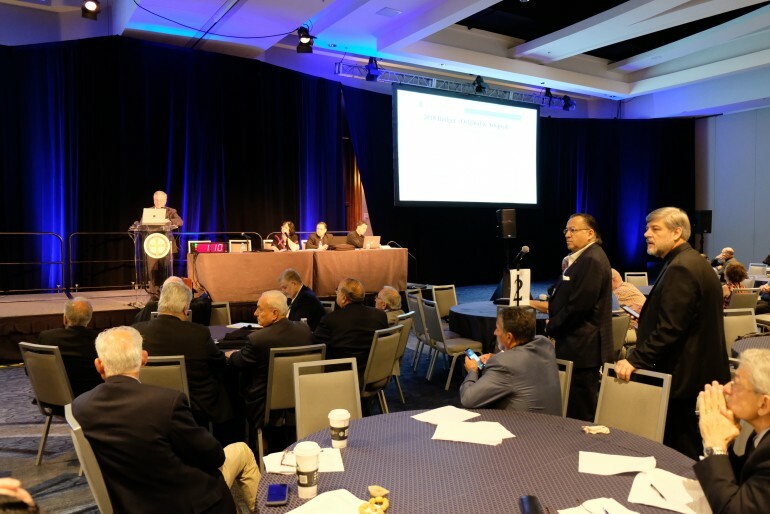 In a huge room with 1,000 delegates in attendance, both clergymen and laymen took the microphone during an open forum posing tough questions to the panel about the Church’s financial crisis and the status of St Nicholas. 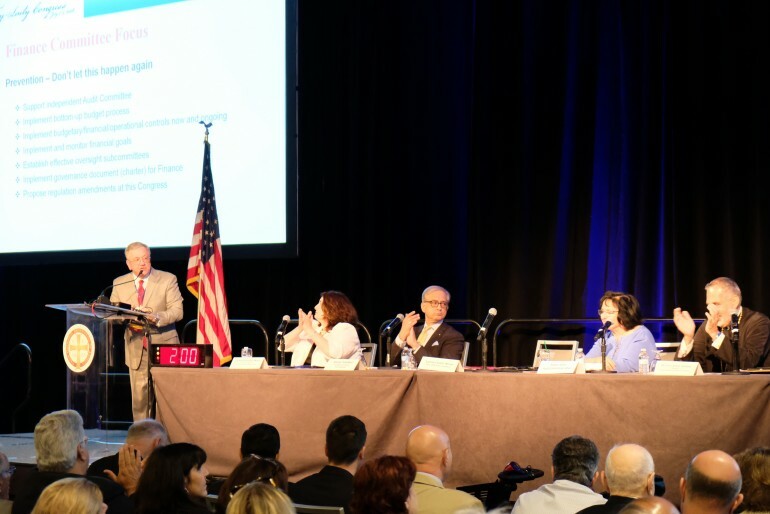 Participating at the panel were Vice Chairman George Tsandikos, Chancellor Bishop Andonios, Finance Committee Chairman Lou Kirkos, Legal Council Cathy Boufides Walsh and Audit Committee Chairperson Elaine Allen. “We know mistakes were made, we know we broke your trust. It will take time to get it back”, Tsandikos said. Lou Kirkos said the financial problems were resulted from structural deficits that occurred between 2012-2016. A delegate from St Nicholas Flushing said “you betrayed our Fathers. I take this very personally”. Lou Kirkos and others insisted that they were all kept in the dark for 2-3 years and when they learned it was already too late. He said when he learned about the problems he was outraged. Since then, measures have been taken to ensure these thing will never be repeated, including audits, financial controls that have been put into place and an oversight committee that has been established. In addition 43 members of the Archdiocesan staff were eliminated in order to cut the budget. Bishop Andonios told the audience that no money is missing from the St Nicholas account and that money used from the restricted fund has been returned with interest. No one raise the question who received commission for the fundraising activities, or why instead of the really expensive Architect Calatrava, Greek American Nicholas Koutsomytis is shown so far to have collected more than the famous Spanish architect. Hearing Archbishop Demetrios to say he is deeply sorry for what happened was comforting for the delegates. In addition, Ecumenical Patriarch Bartholomew in his message expressed his deep concern for the unfortunate occurrences in the Archdiocese but also his confidence in a favorable outlook for better days, and he used the “key word” “patience”. 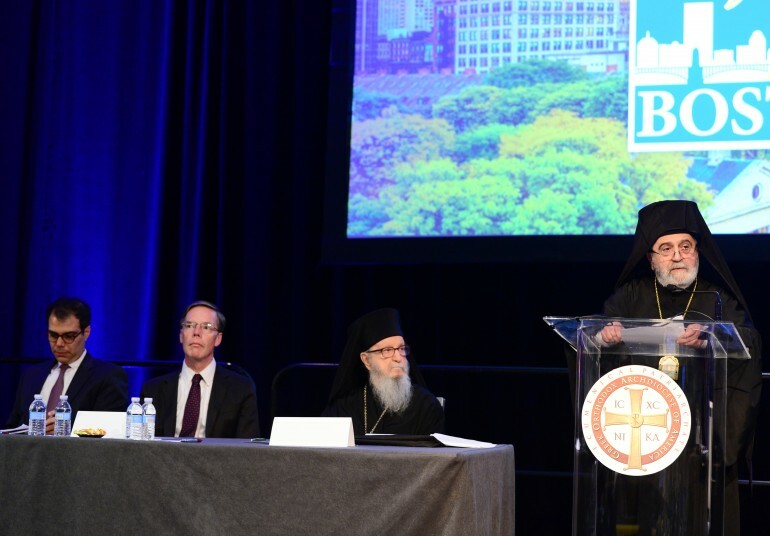 44th Biennial Clergy Laity Congress of the Greek Orthodox Archdiocese of America began with the Keynote Address of His Eminence Archbishop Demetrios of America, Monday morning July 2, 2018. 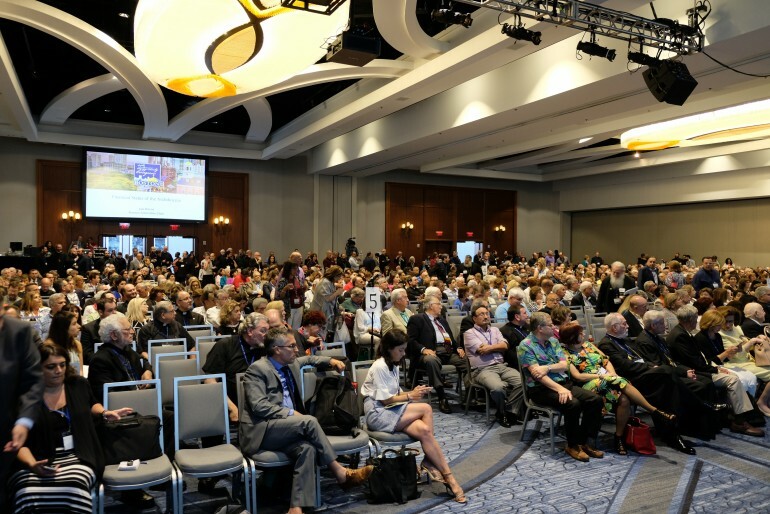 The National Ladies Philoptochos Society concurrently and according to tradition, holds its own Philoptochos Biennial Conference; and both take place this year in the Boston Marriott Copley Place Hotel, thirty years after the 29th Congress that was held here in 1988. Archbishop Demetrios of America led the opening prayer service assisted by Fr. Theodore Barbas, Chancellor of the Metropolis of Boston, Archdeacon Panteleimon Papadopoulos and Deacon Eleftherios Constantine. All the Metropolitans of the Holy Eparchial Synod were present, as well as the representatives of His All Holiness Ecumenical Patriarch Bartholomew His Eminence Elder Metropolitan Apostolos of Derkoi and His Eminence Metropolitan Maximos of Selyvria. Panagiota Haloulakou sang the National Anthem of Greece and Presvytera Katerina Makiej sang the National Anthem of the United States. The National Forum of Greek Orthodox Church Musicians chanted the ecclesiastical hymns. Michael Sophocles, Congress Co-Chair, welcomed the more than a thousand attendees to the Opening Ceremony. Greek American journalist and former News Anchor Mike Nikitas, served as the Master of Ceremonies. 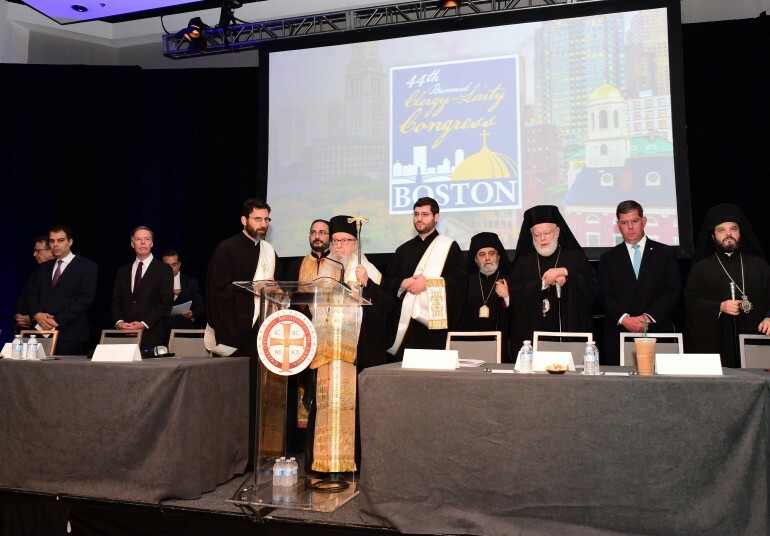 The Mayor of Boston, the Honorable Martin Walsh, expressed his appreciation for the Clergy Laity Congress taking place in Boston, welcomed the participants and underlined the important role of the Greek Orthodox Church and community in the life and advancement of this great city, known around the world as the Athens of America. Nicholas Burns, Former U.S. Ambassador to Greece and presently Harvard University Professor of Diplomacy and International Relations offered a very warm greeting and spoke about the revitalization of the economy of Greece. Present in the opening ceremony was the Consul General of Greece in Boston Hon. Stratos Efthimiou. The President of the National Philoptochos Maria Logus in her greeting to the gathering briefly spoke of the compassionate work of love and philanthropy the twenty-eight thousand ladies of the Philoptochos are doing across the country. Finally, George Tsandikos, the Vice-President of the Archdiocesan Council and highest-ranking lay leader of the Archdiocese, conveyed to the participants a message of unity and hope. Archbishop Demetrios then explained the actions taken and the appropriate measures for corrections including better arrangement and systemic enhancement of the administrative and financial management of the Archdiocese. An open special forum was held later in the afternoon answering all the questions regarding finances. The Archbishop said that the Church always encountered challenges the greatest of which were in the early centuries of Christianity. “Since we are an integral part of the Orthodox Church, we are now facing our own portions of challenges,» he said and analyzed the following four challenges: a) The non-stopping change in everything, b) Economic pressure and poverty, c) Disconnecting from the Church and d) Attacks against the Christian Faith. His Eminence said that “in order to successfully confront the aforementioned challenges, we have to undertake a number of important tasks and put forth specific goals and proposals. (see full text). 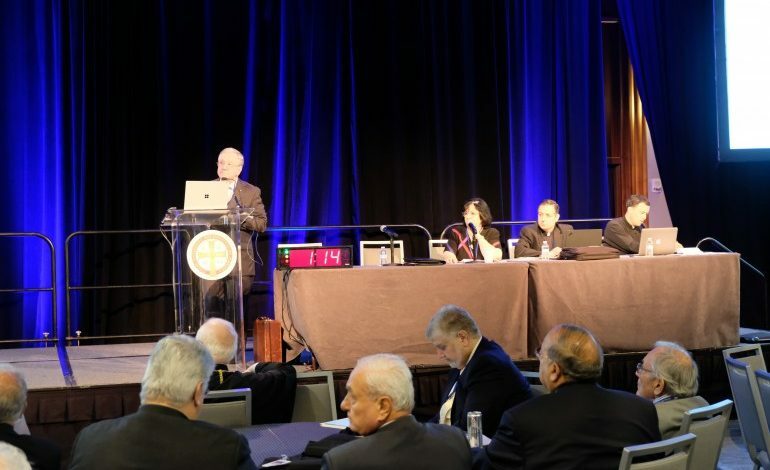 At the conclusion of the morning session, the Legal Counsel of the Archdiocese and Secretary of the Archdiocesan Council Dr. Cathy Walsh declared the Congress open. She announced that as of that moment there was a total of 346 participating parishes and 1,421 representatives as follows: 367 registered delegates to the National Philoptochos Convention, 1054 total registered participants in the Congress of which 736 registered Clergy Laity delegates, and 318 other representatives and participants associated with the Archons, the Retired Clergy Association, the Sisterhood of Presvyteres etc.